A popular cognitive performance-enhancing drug, modafinil is well known to boost focus and motivation. Many use it as a tool to help power through both the most difficult, and the most mundane of tasks. When doctors prescribe medication, they always give clear instructions on how to use it. Those instructions, which include dosage information, are specific to you and your needs. But if your goal is an off-label use, your exact modafinil dose isn’t necessarily clear. It’s up to you to methodically figure out how much you should be taking and when. Armed with the information below, you will be able to do precisely that. You’ll have a much better understanding of exactly how to go about it, and how to do it safely. How Much Modafinil and Armodafinil to Take? Before getting into dosage specifics, it’s important to note that there are two types of modafinil commonly used: modafinil and armodafinil. 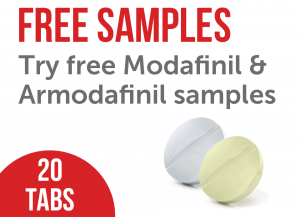 Modafinil goes by the brand name Provigil, and generic names Modalert and Modvigil. The brand name for armodafinil is Nuvigil. The generic versions are called Waklert and Artvigil. The two substances are closely related. They’re similar structurally, and nearly identical in their effects. There are, however, a few critical differences between them. Modafinil is a racemic mixture which has two isomer molecules. Isomers share the same chemical formula, but their atoms have different arrangements. They also don’t necessarily share the same properties. In the case of modafinil, the isomers are called enantiomers, which means they’re mirror images of each other. Unimaginatively, they’re named the L enantiomer and R enantiomer. Fully extend the fingers on your left and right hands and put them next to each other in front of you. It’s a good analogy for this concept. Armodafinil is an enantiopure compound of modafinil. It’s made up of only one of modafinil’s two enantiomers, the right one. 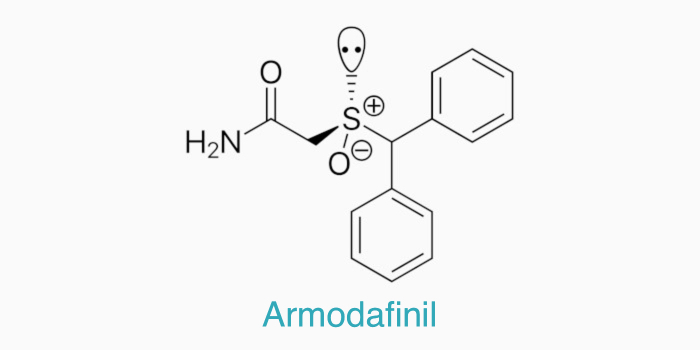 Armodafinil is also stronger and has a longer half-life than modafinil (1). As you can imagine, this affects how much of each compound you should take to achieve your desired goals. Both modafinil and armodafinil have many applications, ranging from ADHD and narcolepsy treatment to cognitive enhancement (2). How much you want to take will differ depending on what you’re trying to accomplish. Below are the most common uses for the two compounds and guidelines on how much you should consider taking for each. The average amount of modafinil prescribed to treat ADHD is 200 mg (3). For armodafinil, it’s 150 mg. Depending on a variety of factors, those numbers could go higher. Research has shown up to 400 mg of modafinil and 250 mg of armodafinil as effective amounts (4). When treating ADHD, it’s generally recommended to take the medication daily but to skip a day or two each week. This regimen helps prevent the chance of developing any longer-term side effects (5). 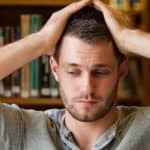 The standard modafinil and armodafinil amounts for treatment of narcolepsy are the same as those used for ADHD: 200 mg for modafinil, 150 mg for armodafinil (6). Here too research shows that, when needed, amounts as high as 400 mg of modafinil and 250 mg of armodafinil may be useful (7). Unlike those seeking treatment for ADHD, however, narcolepsy sufferers shouldn’t necessarily take any days off from using the medication (6). Doing so may cause symptoms to flare up significantly. Ultimately, it’s a decision each person needs to make individually. If you intend on or are taking modafinil or armodafinil for cognitive enhancement, something it does very well (8)(9), the dose can range anywhere from 50 mg to 400 mg for the former, and 50 mg to 250 mg for the latter (10). The exact amount depends on your goals. The smallest effective dose of modafinil is 50 mg. Anything under that falls below its therapeutic threshold (5). 50 mg is also the smallest effective dose for armodafinil. Since armodafinil is a little stronger, you will feel it a bit more. But at these amounts, the difference should be negligible. Using a smaller than standard dose has several benefits. It’s the safest option if you’re starting out with modafinil. Likewise, it’s the safest way to go for long term use (11). It may also turn out that a reduced amount is all you need to get the desired effect. There’s absolutely no reason to take more than you have to. For example, some people use small doses of modafinil as caffeine replacement after they get up in the morning. It promotes a very gradual increase in wakefulness for 30 to 45 minutes. For that purpose, taking more than 50 mg is unnecessary. When bought online, modafinil pills usually come in either 100 mg or 200 mg sizes. To get 50 mg, it’s easy enough to break a 100 mg tablet into two. The crease in the middle of the pill helps ensure an even split. Breaking a 200 mg tablet into four is also an option, though it’s tough to do precisely. Mashing the pill into powder and splitting that into for equal piles yields more accurate results. Armodafinil, on the other hand, sells pretty much exclusively in 150 mg sizes. Splitting a pill into thirds is just as tricky as into quarters. The powder method works best here too. Accurate measurements aside, there is also another advantage of turning modafinil into powder. When you take either substance in that form, it takes less time for it to enter the bloodstream (12). You start to feel the effects quicker. When starting with modafinil and figuring out how your body responds to it. When the full effects are not needed. For long term daily use. When trying to limit the chance of side-effects. The standard modafinil dose for cognitive enhancement is 200 mg. The equivalent dose of armodafinil is 150 mg. Hands down, these are the most commonly taken amounts. It’s the reason why most pills you buy online come in these sizes. As the standard dose, 200 mg is also the amount backed up by the most significant amount of research. Clearly defined cognitive enhancement effects. Easy to take since it does not need pill splitting. Most easily accessible dosage online. Backed up by the most research. The highest safe dose of modafinil is 400 mg.
For armodafinil, it’s 250 mg. Taking any more significantly increases your risk of developing side effects. Studies have shown it also doesn’t necessarily help you in any way (13). That said, a modafinil dose larger than the max may be beneficial in a few cases. 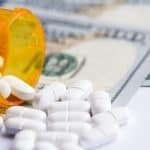 If, for example, you have developed a tolerance to modafinil after prolonged use, you may want to consider taking more for short amounts of time. Likewise, if you have a larger build or metabolize drugs quickly, increasing your dosage beyond the standard may be necessary. That said, if you are just starting with modafinil, stay clear of large doses until you understand well how your body reacts to the drug. Going for too much too quickly may cause severe anxiety (14), insomnia (15), and any number of other side effects. Always start with 50 mg and work your way up from there. Using a high dose should also be more the exception than the norm. As noted, a large dose of armodafinil is 250 mg. The issue is armodafinil pills come in sizes of 150 mg. Since splitting a pill into three is no easy task, taking exactly 250 mg can be tricky. The answer is (once again) mashing two tables into powder and measuring out 5/6 of the resulting pile. It’s your best bet at being precise. If you do end up just taking two pills for a total of 300 mg, remember that the effects you will feel will be stronger than those given by 400 mg of modafinil. You will also be increasing your odds of experiencing side effects. In summary, a large dose of modafinil or armodafinil may be appropriate in the following cases. You have a larger build. Your body metabolizes drugs quickly. You have developed a tolerance to modafinil and need a short term boost in effects. 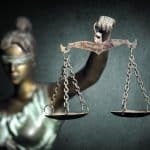 Remember that even though these doses are considered equivalents to each other, due to its strength, armodafinil will still deliver a slightly more intense experience. 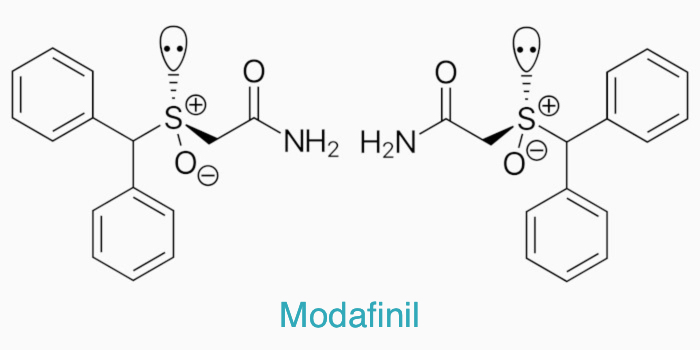 Though safer than the typical stimulant, modafinil use may still result in some side effects. The good news is that most of them are relatively subtle. Some more common modafinil side effects include headaches, dry mouth, reduced appetite, digestive discomfort, and insomnia. The higher the dose you take, the higher your chance of running into these (5). When using a smaller 50 mg dose, you will rarely experience problems. At 400 mg, however, headaches are quite common, as are bouts of insomnia (15). Regardless of how much you take, always stay well hydrated. Drink a minimum of 2 to 3 liters of water per day. Make sure you have a good meal before using modafinil too. Doing both these things will help prevent most minor side effects (5). To make sure you can sleep after taking modafinil, properly timing when you use it is critical. You should also limit or avoid caffeine intake. Side effects more severe than the ones described above are rare. However, if you start feeling symptoms like dizziness, hallucinations, or hysteria, have difficulty breathing, or experience any rashes or skin reactions, stop taking modafinil immediately. It’s time to see a doctor. Anytime you start using a new drug or supplement, going with a lower dose is recommended. Doing so gives you a chance to check and learn how your body reacts. Two important things you’ll find out is whether you’re allergic and if your body can metabolize and eliminate the drug effectively. Like most other substances, your liver metabolizes modafinil (16), and not everyone’s liver functions the same. Take, for example, another substance metabolized by the liver, caffeine (17). Why is it that some people can drink 5 cups a day without any issues, while others are wired for hours on end after a single cup? People in the first group can metabolize caffeine much more effectively than those in the latter. The same can be true for modafinil. If it turns out your liver does not eliminate it from your system as efficiently, its effects will last much longer. 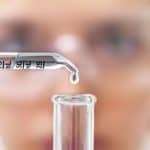 Over time, you may also start to build up higher concentrations of it in your blood (5). Only once you confirm things are working well at the lower end of the dose range can you consider increasing it (assuming, of course, you want or need to). You should also do it slowly. Week Daily Dose Experiencing Side Effects? When used off-label, modafinil can be an incredible smart drug. Be it at work or in school, it’s very effective at increasing your focus, motivation, and overall productivity. As with any drugs or supplements, however, getting the dosage is key. Take too little, and you won’t achieve the desired benefits. Take too much, and you increase your chance of experiencing side effects. If you’re a new user start with a 50 mg dose of either modafinil (Modalert or Modvigil) or armodafinil (Waklert or Artvigil) and work up from there. As you do so, keep in mind that the maximum recommended daily dosage for modafinil is 400 mg and for armodafinil 250 mg.
Also, remember to eat plenty beforehand and stay well hydrated throughout. At any modafinil dose level, both those things will keep the odds of developing side effects to a minimum. David E McCarty. Ready for takeoff? A critical review of armodafinil and modafinil for the treatment of sleepiness associated with jet lag. Nat Sci Sleep. 2010; 2: 85–94. Wang SM, et al. Modafinil for the treatment of attention-deficit/hyperactivity disorder: A meta-analysis. J Psychiatr Res. 2017 Jan;84:292-300. Biederman J, et al. A comparison of once-daily and divided doses of modafinil in children with attention-deficit/hyperactivity disorder: a randomized, double-blind, and placebo-controlled study. J Clin Psychiatry. 2006 May;67(5):727-35. [No authors listed]. Randomized trial of modafinil for the treatment of pathological somnolence in narcolepsy. US Modafinil in Narcolepsy Multicenter Study Group. Ann Neurol. 1998 Jan;43(1):88-97. Turner DC, et al. Cognitive enhancing effects of modafinil in healthy volunteers. Psychopharmacology (Berl). 2003 Jan;165(3):260-9. Epub 2002 Nov 1. Maddalena Mereu, et al. The neurobiology of modafinil as an enhancer of cognitive performance and a potential treatment for substance use disorders. Psychopharmacology (Berl). Author manuscript; available in PMC 2014 Oct 1. Thomas P Lillicrap, et al. Short- and Long-Term Efficacy of Modafinil at Improving Quality of Life in Stroke Survivors: A Post Hoc Sub Study of the Modafinil in Debilitating Fatigue After Stroke Trial. Front Neurol. 2018; 9: 269. Anjan K. Mahapatra, et al. Solubilization and Solid-State Characterization of Modafinil Solid Dispersions using PVP K 30. Der Pharmacia Lettre. 2011, 3(1): 29-37. Richard B Berry. Fundamentals of Sleep Medicine. 2012, Pages 451-479. Stefan G Hofmann, et al. Cognitive Enhancers for Anxiety Disorders. Pharmacol Biochem Behav. Author manuscript; available in PMC 2012 Aug 1. Perlis ML, et al. The effects of modafinil and cognitive behavior therapy on sleep continuity in patients with primary insomnia. Sleep. 2004 Jun 15;27(4):715-25. Robertson P Jr, Hellriegel ET. Clinical pharmacokinetic profile of modafinil. Clin Pharmacokinet. 2003;42(2):123-37. Institute of Medicine (US) Committee on Military Nutrition Research. Caffeine for the Sustainment of Mental Task Performance: Formulations for Military Operations. National Academies Press (US); 2001.